In the 1960s, an ancient poem was discovered in the village of Van Asch Mega Van Wijck Baviaanskloof in what is now The Netherlands. It was written on cheesecloth and carbon dated to c. B.C. 200. Scholars at the University of New Mexico have been working on translating it for over forty years. 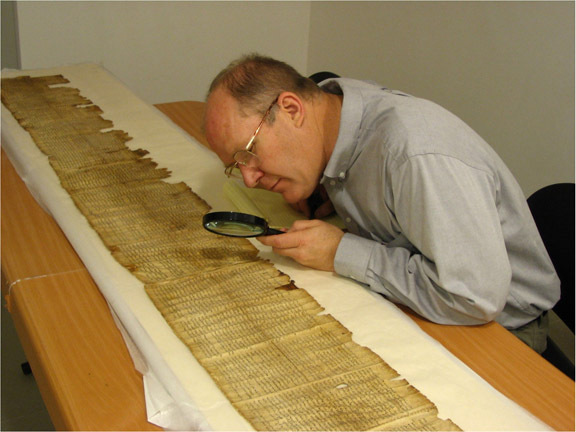 This week, the head of the Archaeological Poetry Department, Dr. Philip Van De Naaktgeboren, announced that he has managed to translate several quatrains of the original 6,000 line poem. Unfortunately, due to budget cuts, the rest of the poem won’t be translated for some time. FOG has attained exclusive rights to publish it for the first time. Below is the original poem and the new translation. For ease, I’ve included the original line followed directly by the translation in a smaller gray font. Dr. Philip Van De Naaktgeboren, head of the Archeological Poetry Dept. at NMU, examining the original poem. Posted in fiction, funny business, Prompts For The Promptless and tagged fiction, poetry, shenanigans. Bookmark the permalink. That must have been as far as it had gotten before the head cow was turned into a nice juicy steak. I was moving right along with believing everything, until the automatic weapons, and then I ignored my instincts because everything you read on the internet is true, totally made up or not. How cool is it that you got exclusive rights to this ancient poem. High five! Yeah, the automatic weapons, they were kind of… anacronistisch, it seemed. Great poem though, people like Shakespeare undoubtly found it a source of inspiration. How did you come up with that name though, Goldfish? I don’t think there are many more Dutch names that would have fit this so well. I’m from Belgium, so I didn’t need to translate it if that’s what you mean :). It sort of caught my attention right away… For the obvious reasons… I do believe though it could be real, current name over there. This is awesome. And not because I was just writing about pot roast. Now I want steak too! I know, it’s all his fault! Make him get us steak? Great idea and not only that bbq it for us! I think we need to get on Kickstarter right quick smart and raise money for Professor Naatgewas’name to at least translate the rules. Who’s with me? I don’t wanna die a cow-related death. Unless it’s from years of eating too much steak. Mmm, steak. Indeed. We don’t really know what the cows are up to!